What is this simpleton Rick Neuheisel doing as a studio analyst on the Pac-12 Network? 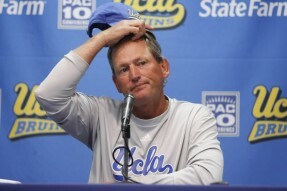 How many Pac-12 football programs has Rick Neuheisel destroyed? You wouldn’t know it from watching them lose at home today to Colorado State, but the University of Colorado was an elite program, a national championship winner, when Neuheisel inherited the program from Bill McCartney. Colorado football has never recovered from Rick Neuheisel. Washington Husky football, thanks to Steve Sarkisian, is just starting to recover from Rick Neuheisel. I can’t say that Neuheisel wrecked the UCLA football program because there wasn’t much to wreck, but he was at least as bad and probably worse than his abysmal predecessor, Karl Dorrell. Neuheisel’s last game at the helm was a 50-0 dismantling by USC, the worst loss in the rivalry in 70 years. Neuheisel is a stupido. He looks stupid. He sounds stupid. He’s killing my enjoyment of the games and he’s killing the credibility of the network.